I have just published a feature in the Friday supplement of The Rising Nepal, one of the country’s Eng;ish language newspapers. Why? Well, The Rising Nepal helped me start my career in 1997. The paper graciously offered me the use of a typewriter and I hammered out a series of feature stories on Nepali culture which ran in the winter of 1997 and 1998 and set me off on my journey to become a writer. My first ever published story (except for a series of articles I had written for a German daily during a newspaper internship and features in student magazines in Germany and the UK in the late 80s) was a full page Friday Supplement story on Nepali Folk Music. As I was in Kathmandu recently, I went to see theThe Rising Nepal’s editors once more and they offered me another Friday Supplement feature as well as a chance to take stock of a country I have written about over a period of 15 years. Life rarely comes full circle, so am very pleased to be published in Nepal once more. It’s really a nostalgic thing. And I am very happy to be able to slip some advertorial content about myself into a stock-taking of Nepal’s turbulent recent history. I first arrived in late summer in 1997, a young German traveler with some vague, romantic notion of becoming a writer. I had studied publishing in the UK, but had joined several rock bands and toured all over Europe in the early 90s. There, I caught the travel bug and headed for India in 1992, collaborating on research with the British Library’s National Sound Archive to document indigenous and minority music across the region. Encountering Asia was love at first sight: everything fascinated me – the sights and music, history, politics and people. By the time I reached Kathmandu, a heavenly city of pagodas populated by gods and monkeys, I was working on a novel and was trying to figure out how I could avoid returning to Europe twice a year to earn money. In a guest house on Freak Street, I met two cyclists who had ridden from Europe to Kathmandu. They needed help editing the articles they had written about their journey. And so, on a cold November morning, I found myself in the offices of The Rising Nepal, talking to the paper’s editors. By the time I left an hour later, I had been graciously offered to write a feature on Nepal’s traditional music. A few weeks on, I made my newspaper debut with a full page article on quickly disappearing folk sounds. The paper’s editors were delighted and I published two more stories on tourism as the country rang in its Visit Nepal Year in 1998. Kathmandu was a magical place in the late 90s. Globalization was just around the corner, but the Himalayas still provided some protection from the huge changes that were coming. The country was beautiful, the rivers were clean and the mountain views clear, the capital was a quiet backwater of ancient temples and elegant town houses and governance were anarchic but hardly obtrusive to the thousands of tourists who flew in every year. People were welcoming, in a humble way their much larger neighbors never could be, and in autumn the country was flooded with attractive western kids who had come to trek in stunning alpine pastures and commune with hard working, open-hearted Sherpas in the Solu Khumbh or enjoy the magnificent spectacle of the Annapurnas. It was hard to see the shadow side of all this – the high youth unemployment, the catastrophic public services and dysfunctional politics and, most importantly, the fermenting discontent amongst large parts of the population. To the foreign visitor, Nepal was a picturesque paradise where even poverty, as long as it was coupled with tradition, could look beautiful to relatively affluent and relatively self-absorbed visitors. I left in early spring 1998, finished my novel which was eventually published as The Devil’s Road to Kathmandu and wrote documentary screenplays, articles, guide books and several non-fiction books on Asian culture. Kathmandu had made it all possible and put me on the road to become a professional freelance writer, the job I still love today, almost fifteen years later. I covered the Maha Khumbh Mela in Allahabad, interviewed India’s maharajas and wrote about the world’s most expensive tea. I traveled with sea nomads in Southeast Asia, attended a coronation and several elections in Cambodia and investigated the CIA’s largest ever campaign in 1960s Laos for a cinema documentary. In Thailand, I met my wife, photographer Aroon Thaewchatturat, with whom I have recently published a seminal book on the country’s sacred tattoos (www.sacredskinthailand.com). Back in 1998, in a small room on Freak Street, I dared not imagine such a career. But I stayed true to my dreams and almost six years later, in late 2003, I was back, this time as a more experienced journalist. The city and country had changed. I had returned with a photographer to cover Nepal’s civil war. As soon as we got off the plane, we witnessed fierce and bloody street battles between young demonstrators and riot police. The tourists had disappeared. In Pokhara, we interviewed a distraught bank manager whose son had been shot by soldiers the night we arrived. We spent a week walking with a Maoist cell in the hills above Pokhara. The youngest rebel was 14 years old, the oldest in his 50s. They were farmers, truck drivers and teachers, were armed with woefully inadequate weapons and had joined the movement because the traditional way things were done did not offer them enough opportunities. The Maoists treated us well (we had problems keeping up with their walking pace) and rarely harmed foreigners during the conflict. Consequently my reporting turned out quite favorable, yet my then client did not publish our efforts. We had risked our lives crossing the front lines twice and walking through hills where army helicopters regularly attacked hamlets and villages, all for nothing. But Kathmandu took care of me again and through a local journalist, we managed to conduct an interview with Charles Sobhraj, alleged and notorious serial-killer celebrity and an inmate of Kathmandu Jail, and the charismatic police officer who had arrested Mr. Sobhraj a few weeks prior to our arrival. The as yet to be convicted prisoner assured me of his imminent release. We spent Christmas in a virtually deserted Kathmandu, the streets patrolled by armed troops, the populace both cowed and angry. The city smelled of burning tires and every day brought new demonstrations against both the government and the monarchy. Hard times. Fast forward another seven years to November 2011. Nepal is at peace. And it’s great to be back. The Maoists have joined the political mainstream. A new constitution has been worked on for some years. But, Lonely Planet informs me that my beloved mountain capital is now a polluted, hectic metropolis. Things are ‘apocalyptic’. Indeed, coming in from the airport, it looks like the most trusted guidebook in the world has got it right – Kathmandu appears to have grown into an urban monster. The air is hazy and the traffic is chaotic. The entire valley floor is covered with houses and it looks like new properties just fell from the sky and lodged themselves in what were rice fields a few years ago. And there are other radical changes. The traffic police, so Lonely Planet claims, are corrupt, regularly robbing drivers by the sides of the capital’s pot holed roads. And every few meters, garish signs invite punters to dance bars, a euphemism for establishments where men rent young girls. So what exactly was achieved in more than a decade of war? At first sight glance, this looks like a typical post-war society with a weak government in the developing world. But first impressions are often misleading. In fact, the negative changes Kathmandu has experienced in the past decade are hardly local or confined to struggling economies – they are in tune with what is happening in the rest of the world, not least in neighboring India and China. And on my first walk, from madly buzzing Thamel – the tourists are back in huge numbers, they are older and wealthier, they come for the right reasons and are pouring much needed foreign currency into the country – down to Durbar Square, New Road amd Bimsen Tower, I see many positive changes. The old city remains traditional, the shrines remain active, and old men still wear topis, but teenagers, both boys and girls, now dominate public life. The average Nepali citizen (no longer a subject) is twenty years old. They wear jeans and T-Shirts and are beginning to have a voice, slowly questioning old social norms. In the suburbs, couples can be seen holding hand in public, and a few youngsters forsake arranged marriages, choosing their own partners, irrespective of caste and financial background. Women, at least in the city, are becoming more vocal. To outsiders, Kathmandu remains a uniquely beautiful city. Overhearing countless conversations in the crowded tourist restaurants of Thamel, it’s obvious that the old magic and the new dynamic of Kathmandu catch the visitors’ attention. And judging by what’s written in the local English language papers – Nepal currently enjoys a fairly free press – politics remain turbulent and change will come slowly. But power-cuts and fuel shortages are far less acute than a few years ago, and most importantly, young people are seeing improvements. Never mind what guidebooks have to say. Kathmandu is back in all its rugged glory. I will be back. A review in the Nepali Times of my novel The Devil’s Road to Kathmandu. 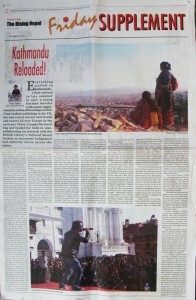 A piece on Nepal’s civil war from 2003. My interview with Charles Sobhraj, convicted serial killer celebrity. Morrocco Reloaded. Another country I have been visiting occasionally in the last 20 years. Another semi-autobiographical low-down on my work.